A third Wii U bundle will be available later this month with two games, a Pro controller, and a collectible booklet. 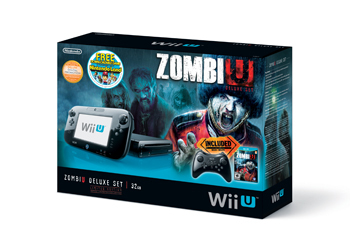 There are already two Wii U console bundles available, but there's a glaring issue with both--not enough zombies. Nintendo is fixing this egregious error by releasing a ZombiU Deluxe Wii U set, which, naturally, includes Ubisoft's survival horror game. The ZombiU bundle will be available in the United States and Canada on later this month with a suggested retail price of $389.99. In addition to ZombiU, the bundle will also come with a collectible booklet featuring artwork and developer commentary from Ubisoft's take on the zombie apocalypse and a Wii U Pro controller. Since it's basically a Deluxe Wii U set with some extras thrown in, it will have all of the other inclusions you'd expect, like a black console and GamePad and Nintendo Land. Interestingly, though, Nintendo Land will be available as a downloadable copy, not a physical game disc like regular Wii U Deluxe bundles. The Pro controller and ZombiU are $50 and $60 respectively, so considering the regular higher-end Wii U bundle retails for $350, this is a pretty good deal. The ZombiU set will on sale February 17; Nintendo's press release didn't mention whether or not it was a limited time release.